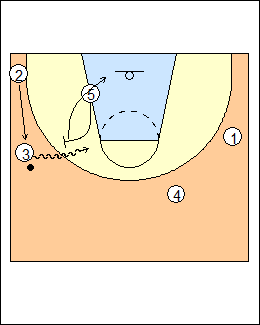 Ballscreen breakdowns to work on spacing. The strong-side corner is filled (corner filled). 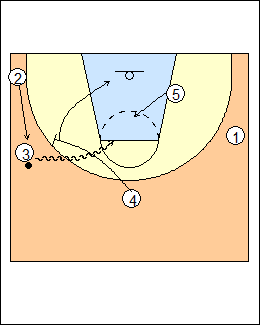 See Quick hitters - Enfield ballscreens. Lift 4, 5 sets a side ballscreen, 3 comes off, 5 goes to the rim, 2 fills behind. 5 can reverse pivot or forward pivot, but has to be at the rim in three steps (he has to sprint), and posts on a throw-back to 2. Many teams like to sag the opposite big to help on the roll man, but here X4 can`t help on the roll if 4 can shoot, help has to come from X2 (leaving 2 open). 4 is not necessarily a three-point shooter, 3 hits the duck-in if X4 helps on the roll. 4 puts his hips and legs on his defender and seals (Enfield shows a two-step step-through, L-R). 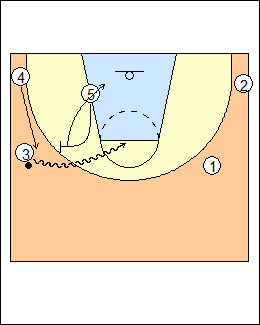 4 is in the weakside corner, takes one step towards the ball and runs to the rim for a lob, pointing. This is what 4 does from the corner on a middle drive, see Tactics - Enfield penetrate-kick spacing. 4 is in the ballside corner and fills behind the ballscreen, extremely hard to guard if he has some skill. Help on the roll has to come from X2 or X4. You may prefer to have 5 duck in instead of 4. Whenever the corner is filled, 4 rolls to the rim, they have 4 pop when the corner is open.